How to watch The Way of the Dragon (1972) on Netflix France! Sorry, The Way of the Dragon is not available on French Netflix, but you can unlock it right now in France and start watching! With a few simple steps you can change your Netflix region to a country like Japan and start watching Japanese Netflix, which includes The Way of the Dragon. We'll keep checking Netflix France for The Way of the Dragon, and this page will be updated with any changes. The Way of the Dragon is not available in France BUT it can be unlocked and viewed! Tang Lung goes to Rome to help his restaurateur cousin address the local syndicate's extortion demands, making short work of its knife-wielding hoods. At first they thought he was too small and quiet to be a threat. They were wrong. Don't underestimate the kung fu king. There is a way to watch The Way of the Dragon in France, even though it isn't currently available on Netflix locally. What you need is a system that lets you change your Netflix country. With a few simple steps you can be watching The Way of the Dragon and thousands of other titles! 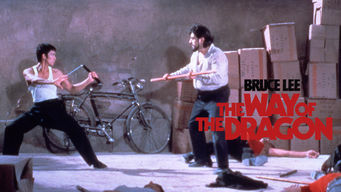 Watch "The Way of the Dragon"